Brothers John and D’avin Jaqobi have been through the ringer this season. From Khlyen trying to put green goo into D’avin, to John getting in serious trouble in the name of Old Town, this is a definite rough patch. Despite this, the brothers have managed to remain close and support each other through each crisis. They even retain their sense of humor! 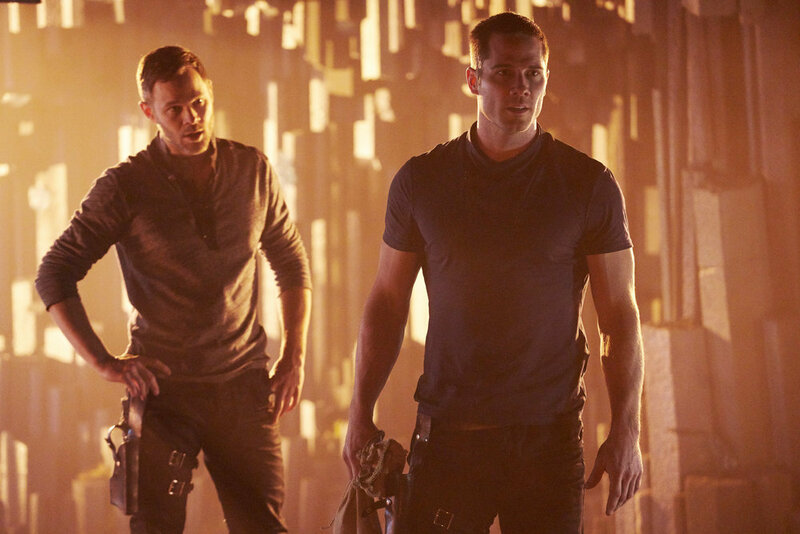 Luke MacFarlane and Aaron Ashmore have great chemistry playing brothers. When they were gracious enough to talk to me and others, you can tell they get along with each other off set. I managed to talk with Ashmore once before episode nine, as well. 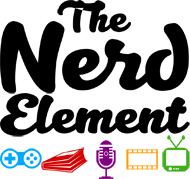 We discuss green goo powers, the special guests and cameos this season, if “John” regretted not following Bellus’s (Nora McLellan) advice and more. Aaron Ashmore: Yeah, well it’s a difficult position to be in because I think the show is about Dutch and about her story, and she’s the character that drives us through. So anytime you withhold information or you’re lying to the main character, I think everybody’s like, “Don’t do that. Just tell her. Just tell her,” but I think it makes sense for John’s character that he’s gonna have to do this. It’s him taking a step out for himself because so much of what he does is just in service to other people. He never takes care of himself. He never does anything that he needs, and I think that by making this decision and deciding to go with Pawter [Sarah Powers], he’s putting his needs up front. TNE: Okay. So how excited were you to work with Tamsen [McDonough] in episode six? Aaron Ashmore: Yeah, it was exciting. I’d met Tamsen a bunch of times, but being that our characters interact so much, I’d only met her a couple times, but not at all on set. 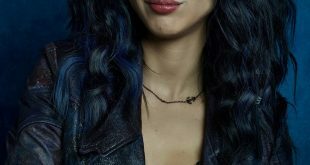 So it was really nice to have her on board because she is such a huge part of the show with such a huge character and such a big – I’ve said this numerous times, that she is the fourth member of the team in some ways. So, yeah, to actually have her get to come on set and be the role, and she was so excited! Obviously, [it] makes it even more fun for us because she was just so happy and excited to be there. It was really cool to get a chance to interact with her, and she did a fantastic job, too! It’s a tough thing to come in and play. It’s one thing to voice the robot and all that sort of stuff, but to come in and actually play the physical actions of being so robotic and in that character I think is really, really difficult, but she pulled it off so well. TNE: I agree, and I miss her already. I want her back! Aaron Ashmore: Yeah, well, maybe later on down the line, but I don’t think we can do it too many times or it loses its novelty, but, yeah, who knows. Maybe down the road we’ll have another chance to see her in physical form. TNE: Yeah. So episode seven, does John regret not taking Bellus’s advice by the end of the episode? I feel like Bellus was warning him because of what happened last time he went off on his own, and I get, from what you mentioned earlier, why he’s keeping everything a secret, but because of that, now he’s in trouble. Aaron Ashmore: Yes, yeah. I think that it’s probably very layered. To be honest, it’s kind of interesting that he got himself into this trouble because he gets the team out of trouble so often, out of impossible situations. He always figures it out. He’s usually a little more clever and a little smarter than to jump in so foolishly, but I think because he’s really – his heart is driving him, so he may not be using his mind as much as he normally does. So, yes, I definitely think that the situation that he gets himself into, he regrets, and I think that it’s at a level, also, that fear that comes out of frustration and embarrassment, too, that he got himself into this mire because, like I said, normally, he’s the one that’s getting the team out of problems. So, yeah, it’s a bit of a pickle he gets himself into. TNE: I was wondering; for Pascal Landsdale who plays Jelco, I think he’s done a really good job playing like a jerk. So how is he on set, like, versus his character? I’m sure it’s complete opposite. Aaron Ashmore: Pascal is nice! Luke Macfarlane: Sooo nice! He brought you food that he cooked, right, when you had your baby. Isn’t that right? Aaron Ashmore: Yes. Absolutely. Like a week or so after I’ve had my baby, Pascal – even when he heard that I was having my baby this summer, my wife and I, he was like, “I’ll bring you over some food.” And he did. He came over with pasta and, I mean, just very thoughtful, very grounded, very cool guy. So think of that that’s in contrast to what we see in Jelco and his character. It’s like he couldn’t be more opposite. And that’s what’s so amazing to watch is that he just plays such a slimy conniving guy but he’s actually very sweet. Luke Macfarlane: And he’s so good – and he’s so game, I think it’s always hard to walk into a set and sort of have to take on these roles. And I know we had this day together; it was just the two of us filming and there was this scene where we were supposed to start walking along and I’m supposed to threaten him. So I was like, “okay sure. If you’re game with that.” And he’s like, “Absolutely!” I was like, am I hurting him? Afterwards he’d be like, “That was wonderful. That’s perfect!” So he’s fantastic! TNE: We’ve seen D’avin deal with the green goo. There’s been these abilities that he’s developed and we got something new in episode eight. 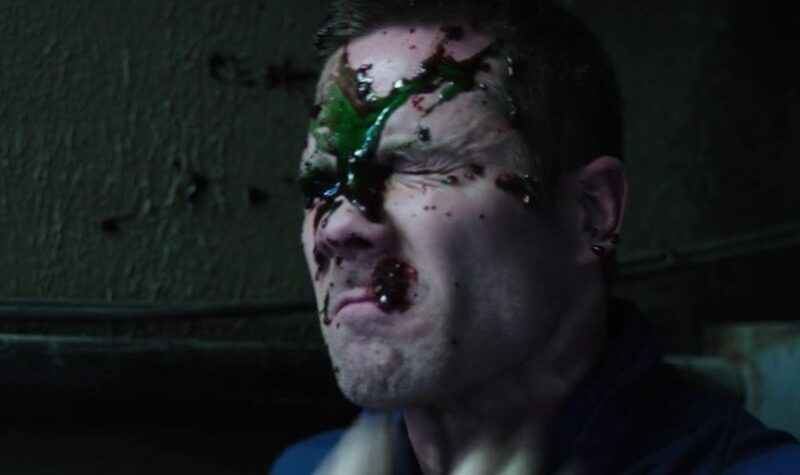 For the finale, are we going to see even more ways that D’avin is able to control green goo? 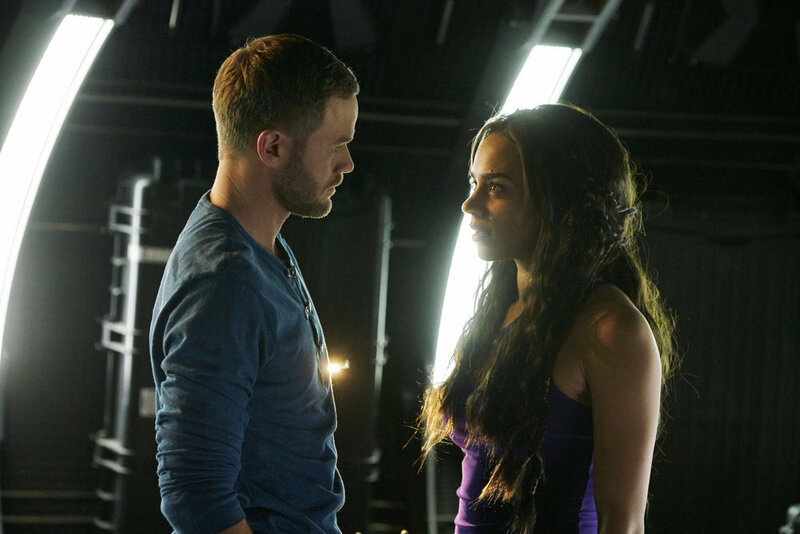 Aaron Ashmore: Do you remember the finale, Luke? Luke Macfarlane: Well, to be completely honest with you – no. I don’t remember the finale. We shot this, what now, five months ago? I had this very specific image and the green goo definitely factors very largely into the finale. But I’m trying to remember if I actually do something magical with it. Oh. Yes, it does! Just came to me. Yes, there’s definitely something with the green goo, I mean, that I manipulate. I’m almost positive, yes. It’s so funny because I remember very clearly – the finale episode is fantastic. I remember these set pieces you end up with something really light and I remember in my head, yes, it was in that location. Yes, and they had that cool thing and Johnny did that cool thing. But I don’t make anybody’s eyes explode, that much I know. TNE: It reminded me of the movie, “Scanners” — I don’t know if you’ve ever heard of that movie. Luke Macfarlane: Of course, yes, totally! It was like “Scanners” meets “Total Recall”. TNE: Yes. For sure. I was like, “Scanners” when I saw it. Aaron Ashmore: I love pudding. That’s fine. Luke Macfarlane: Yes, vanilla pudding on (my face). TNE: I think ground beef wouldn’t go well. So Aaron, you worked with Shamier Anderson. He had a great cameo in episode eight. So what was it like working with him and have you actually tried to watch Wynonna Earp since you worked with him or even before that? Aaron Ashmore: I saw the first couple of episodes of Wynonna Earp and I really liked it. We were really lucky to get him because he’s obviously a very strong actor and it was only one scene. So it was really, really cool that we got him for the show. But I had actually met Shamier years and years ago. I was at a birthday party, went to a laser quest. And him and a buddy of his were there and my brother and I were there and he – we were acting. We’ve been doing it for quite a while. I think he’s quite a bit younger than (Shawn) and I. He said, “Hey, I’m an actor. I’m really trying to do this thing and do you guys have any advice?” So we actually talked with him for half an hour; super, super nice guy. And then, lo and behold, down the line, here he is showing up being like, yes, this is what I’m doing now and I’m doing really well. So it was very, very cool to see him and very cool to see that he’s doing so well because he was a nice guy. And, again, we were super lucky to get him because he did a great job in that role! TNE: Cool! So, throughout the season, there’s been a hint of potential invaders. So will they at least be mentioned in the season finale? Aaron Ashmore: Yes. I think that we’re setting up for that a little bit. You know, that there is an outside force that is sort of asserting its will on the Quad. I think it’s painting that picture when Romwell from the “I Love Lucy” episode is talking about where the green came from and that his world was sort of invaded and taken over. So, I mean, yes, I don’t think we get into exactly what all that stuff is or really get into those storylines but I think where we’re headed to – towards. 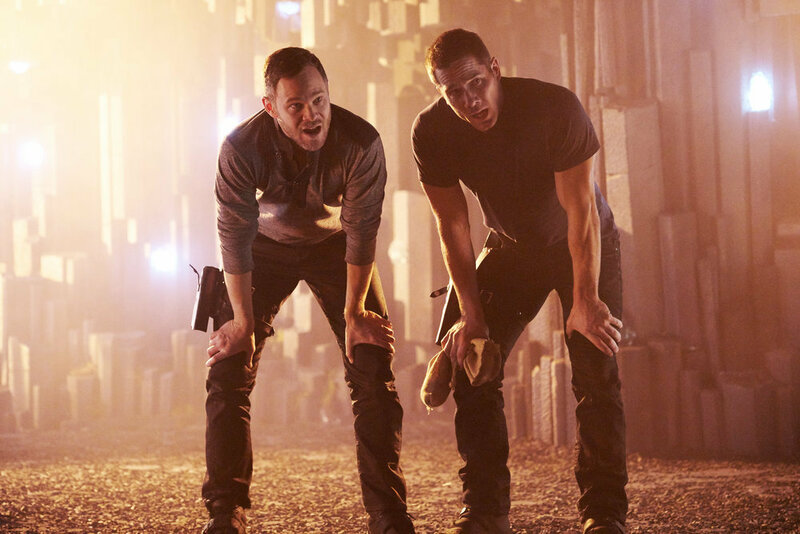 Luke Macfarlane: I remember reading the script and thinking it’s so brilliant. I was like, that’s what season three is what I think is going to explore. Aaron Ashmore: It’s sort of setting up for that. Luke Macfarlane: Yes. In a very big way, yes. TNE: Yes. Because they kind of hinted at it, too, with what happened with Pawter’s parents because she mentioned trying to destroy the planet so they wouldn’t inhabit it. Aaron Ashmore: Lots of little pieces, lots of little bread crumbs, right? And that sort of lead towards that, for sure. TNE: Yes. And just what happened in episode nine, it just seems like that’s – the decisions that some people are making are just driving towards protecting the quad but in a really twisted way. TNE: So, yes, thanks guys. And it was great talking to you guys and asking questions. So thanks and I love the season, hope for a season three. Aaron Ashmore: Yes. Us too. Luke Macfarlane: Yes. Me too. Yes. At the time I talked with the fellas the news of the renewal wasn’t known yet. I’m so happy that Killjoys has been renewed for a Season 3! Yay! This makes me look forward to what they come up with next season, especially after seeing the finale! 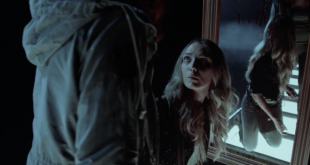 The Magicians’s Hannah Levien: Victoria is NOT Dead Darn it!